- New land: Everspring. In the mountains bounding the ardent forests of Brighbell sits the pristine hamlet of Everspring. The sapphire river flowing from Everspring brings a rich activity to the land, making Everspring one of the most intriguing lands yet!. . - UI and image enhancements. The back button can now be used throughout Game of Words, and the world looks sharper than ever! Choose your House, prepare your brain, and enter the Game of Words! 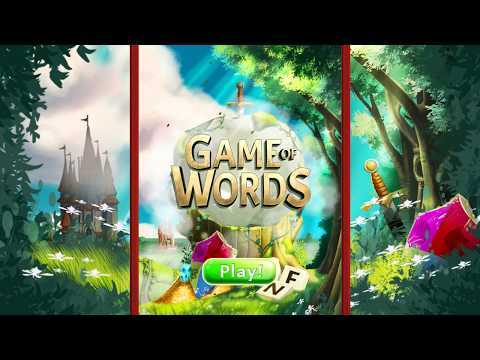 Game of Words combines word finding and crossword fun for an amazing anagram puzzle experience. Choose which House to fight for, then solve puzzles and build your Kingdom. It’s simple to learn and easy to get started, but you... see more Choose your House, prepare your brain, and enter the Game of Words! Game of Words combines word finding and crossword fun for an amazing anagram puzzle experience. Choose which House to fight for, then solve puzzles and build your Kingdom. It’s simple to learn and easy to get started, but you’ll soon find yourself challenged by real brain teasers! Oh, and Game of Words is AD FREE if you want it to be - you’ll never be shown an ad you didn’t want to see! - Are all words found and all words connected? If so, you’ve won! - Improve your lands and expand your kingdom. The English languages is fantastically rich. Those with sharp vocabularies will be able to construct multiple words from a handful of letters and be rewarded for doing so. Find a bonus word - collect extra gold! Finding multiple valid words in a row will super-charge your matches. Collect letters correctly without going astray to gain a rush of coins to the coffers! Although hints may be shunned by those confident in their linguistic prowess, when really put to the test, a hint or two can make life easier. Gold from chest rewards can be spent to reveal random letters within puzzles to help bring solutions into better focus. Riches earned by battling through word connect matches will allow you to make upgrades to your land. A completely upgraded land unlocks a special reward from your House! Your journey will see you move from humble beginnings to the sandy lands of Lothrak, to snow covered castles, mystic fortresses, and beyond. ✓ Over 1000 levels progressing up to 7 letter words! ✓ Addictive, optionally ad-free word puzzle fun! ✓ Free and addictive word challenges! Game of Words is free to play, and great for developing brain and vocabulary skills. Collect letters, connect words, and start playing the best new crossword brain teaser now!